Art Lesson: Painting Made Easy! Art teacher at Flinthill, Rosalia, Kansas. I use this as an introductory painting lesson at the beginning of the year, and the results are always beautiful! I begin by choosing a simple subject, such as fish or butterfly. We "practice" drawing this object until they can draw it large enough to fill a 12" x 18" (30.5 x 46 cm) paper. Step two involves a little preparation on my part. I mix black powdered tempera paint to white glue & let it soak, turning the bottles upside down until well mixed (this usually takes a couple of days). I then pour this black glue into small glue bottles (I order several at the beginning of the year). I distribute these black-colored glue bottles to the students and they squeeze the glue out along the lines of their drawings. It makes a relief outline of the subject. Once dry, they paint inside the outlines of their drawing. It is easy staying inside their lines because the glue is raised. 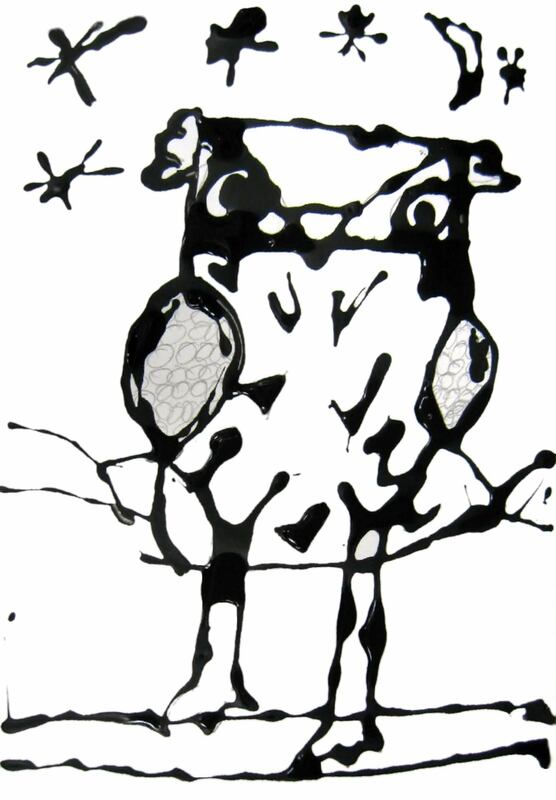 Owl picture drawn with black glue. From Sharpiewoman's blog. "I did mine with Middle school. I used elemers glue mixed with black tempra paint. NOT the best, but I had tons of both and no money to buy other supplies so I used what I had. They drew their faces (from a digital printout) onto Watercolor Paper . Drew black glue over the top of the lines. The drying was the hardest because they have to be FLAT! my Drying Rack were slanted so some problems arose from that and we had to get creative for drying space. They they filled in the spaces between the glue with watercolors. Cool or warm was the assignment." Black Glue Project from Pat's art room in Council Bluff, Iowa. Mess for Less - This blog includes fall leaves created with black glue. Created by a homeschooler. Black Glue Butterflies from Artsonia. Drawing with Glue - KinderArt's lessons with pictures.